This is my most successful attempt at Dutch-Italian fusion and I make it quite often as it is as quick and easy to prepare as it is delicious! The flavors of the bitter endive, the sweet pancetta, the freshness of the white wine and the heartiness (umami) of the parmigiano blend really well. Just like most Italian dishes, the result will depend on the quality of the ingredients. 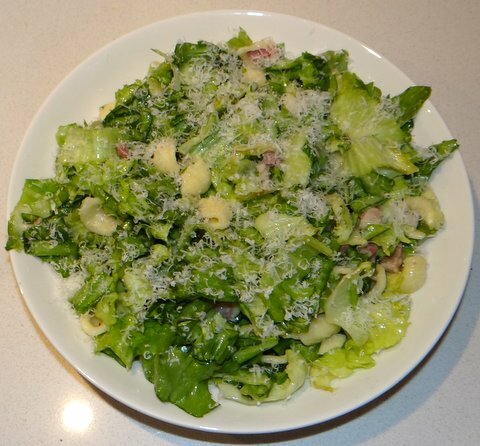 This dish will taste best if you use actual pancetta, fresh endive (rather than already cut when you buy it), freshly grated nutmeg, freshly grated parmigiano and artisan orechiette. The classic Dutch home-cooking dish that it is based on is mashed potatoes with raw endive and bacon (“andijviestamppot met spekjes”). By replacing the potatoes with pasta, the dish becomes Italian. 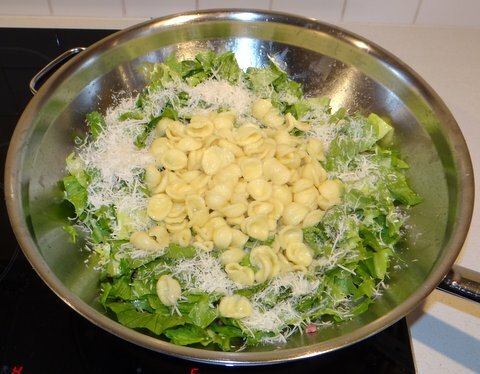 Cook the orecchiette al dente in the time indicated on the package in salted boiling water. Meanwhile, dice the pancetta and sauté it in a large pan (a wok is perfect because the raw endive will take a lot of space) in a tablespoon of olive oil until the pancetta barely starts to crisp. Add dry white wine and simmer until about half of the wine has evaporated. Cut the endive into strips about 1 cm (1/2 inch) wide, wash and dry (in a salad spinner). A few minutes before the pasta is done, add some freshly grated nutmeg to the pancetta-wine mixture. Next add the endive and toss to mix. When the pasta is done, reserve some cooking water and drain the orechiette. Add orechiette to the endive. Add freshly grated parmigiano and a few tablespoons of reserved cooking water. Toss to mix over low heat. If you like the dish to be a bit more like a salad, do not add reserved cooking water and toss briefly away from the heat. If you like the dish to be more warm and the endive more cooked, add more cooking water and toss longer until the endive is cooked to your liking. Serve on preheated plates and sprinkle with some more freshly grated parmigiano and some freshly ground black pepper. Serve with a dry Italian white that is not too bitter, otherwise the bitter of the wine and the bitter of the endive will enhance each other too much.